We were so excited on June 6th, because it was the date we were set to break ground on our new home! We drove out after work to see the progress annnnnd…nothing. Okay, no problem. They’re probably starting tomorrow. Next day…still nothing. Apparently, there was a minor fiasco that impacted the ability for the equipment to make its way to our land and our break ground date was pushed back a week. Welcome to home building 🙂 A lot of things will go as planned, but many small things will not. Be prepared for that and know your team will have a solution for every issue that comes up during construction. in just 22 days!! It really is amazing to watch; the framing team was made up of a lot of hard workers who spent long days on the job to make our dream come true! Let’s back it up though…start from the beginning and talk about what we found to be most important during this phase of the project! The fact of the matter is you don’t know exactly what you’re working with until you’re working with it. The builder doesn’t know for sure what he or she is going to find in the ground until the crew starts digging. For example, they could find field drainage tile in the ground and if they do it’s mandatory they take the right actions to appropriately move it. That means time and potential cost to you. Fortunately, we were lucky and didn’t run into this issue. Our land is simply filled with rocks, rocks, sand and more rocks! And the challenge you’ll see in every phase of the project…scheduling. There’s pros and cons to everything! One of the cons when building with Schumacher, that I’ve found anyway, is dealing with A Lot of contractors. We dealt with this right away when the company delivering the excavator equipment ran into issues and didn’t have a backup option available in addition to other commitments. It’s discouraging when your project gets delayed by a week on day one. Some days nothing will happen. That could be a scheduling conflict with the crew, a hold up waiting on an inspections, etc. Take a deep breath, remind yourself you know it won’t be smooth sailing all the time and keep going! This phase of the project goes by quickly and a lot changes in just a few days. You can be as involved as you want to be during the project, but you’ll need to take initiative. What’s most important at every phase regarding your involvement is being your own inspector every time you visit the site and asking questions every time you have any ounce of concern. Trust me, the team is used to this by now and happy to address any concerns or curiosity. If the answer doesn’t make sense to you, ask a follow up question! Remember, you’re the one living here at the end. Make sure you’re comfortable with all of the work being done. We questioned some of the boards being used in certain areas and found out some have perfectly fine imperfections and such boards are 100% sufficient for non load-bearing walls. Because of the rain we had during this phase, some of the wood was pretty muddy. We addressed this too and made sure replacements were made where needed and boards that could be cleaned were properly conditioned. On a personal note, I highly recommend taking photos every time you visit! It’s amazing to see this progress and once you get to a certain point you almost forget where you started a short time ago with so much happening week after week. We definitely want to frame some of our photos and maybe even our blueprints to hang in our office space. We didn’t have a clear picture of how inspections would go when we left our pre-construction meeting. I made the assumption we would be doing a walk through at the close of each phase before the crew moved on to the next step. Assuming rarely leads to something positive. Isn’t that wildly true? I mean a couple times I’ve assumed Allen was out of coffee creamer and went ahead and picked some up at the store, but outside of that I think it tends to be a poor decision to make assumptions. But, when will I ever really learn that? 🙂 In our case, we were not included in bank or other inspections and had no real visibility to this other than word from our builder. If anyone is taking advice from these posts, I’d have to say I highly recommend being upfront about things like this during initial meetings and clearly setting the stage for what will meet your expectations. I’d also recommend asking for a way to be included in the walk through (we were told these are very informal and usually set for a day, not specific time, and the builder isn’t even always there when the bank, county, etc. stop to inspect). I say find a way to be there or at minimum request an inspection report or comments in writing. It’s important to do your own due diligence at every stage; this is a huge project and a place you plan to call home so although you shouldn’t be expected to do this as the client, I found you have to insert yourself as desired to ensure you’re confident in everything being done. Although it might come at a cost, you can change things at this stage. I have two things I would have re-thought looking back. When you walk into our house from the garage you walk into the laundry room and the next doorway brings you into the kitchen/living room space. Well, the laundry room door is actually slightly more narrow than the garage door. Whyyyy? It’s small, but we were painfully aware of this when moving in large boxes and some of the appliances. The second is the layout for our jack and jill bathroom upstairs. The smaller of the two bedrooms has a walk-in closet and this makes walking into that side of the bathroom a little chaotic with doors and space. It’s not terrible, but I think I would have re-thought the design of the walk-in closet there and asked about options for simply a standard closet in the bedroom and how it could make that side of the bathroom a bit more spacious. The first one potentially could have been a simple and inexpensive change. The second one with the closet probably would have been a bit costly at this point, but structural features are extremely important so be sure you’re happy with everything, because if you’re not this is the absolute best time to speak up. We’ve been in the new house for one week now and we’re still working on unpacking and decorating, but getting closer to being all settled in and I can’t wait to have more time to relax, write and read! But I just have so make our spaces organized and cozy first! I have no idea how my parents did it when they moved two little kids into the new house they had built when I was five two weeks before Christmas, and without even taking time off work! Please, please post any questions in the comments or reach out to me via the contact page! 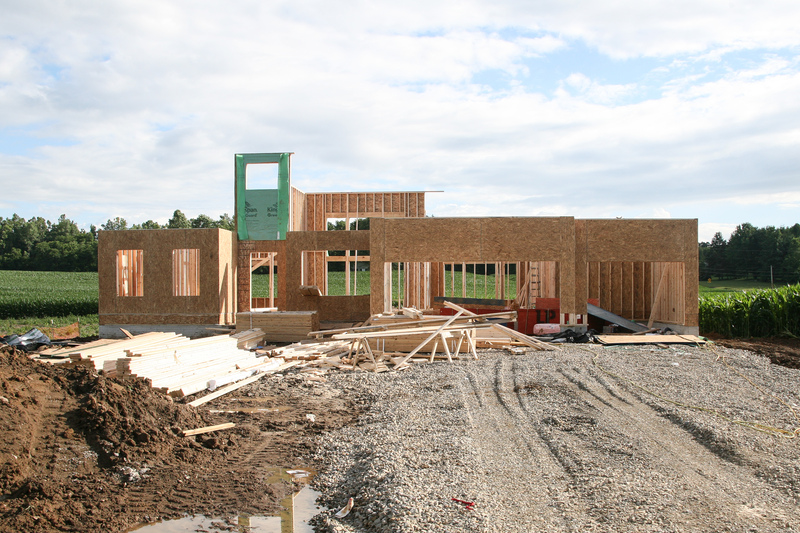 This entry was posted in Construction, New Home Build and tagged breaking ground, building a home, building a house, construction, construction phases for new build, custom build, framing, new build, schumacher homes, what to know about new home construction. Bookmark the permalink.